Okay guys, according to OnePlus CEO, Pete Lau, the OnePlus 6, which will be OnePlus flagship smart phone for 2018, will be coming in the second quarter of 2018, that is anytime between April 1st, to June 30th. Now due to the recent leaked images of the device, this device is something we can comfortably refer to as an iPhone X on the front, and a samsung galaxy s9 at the back. 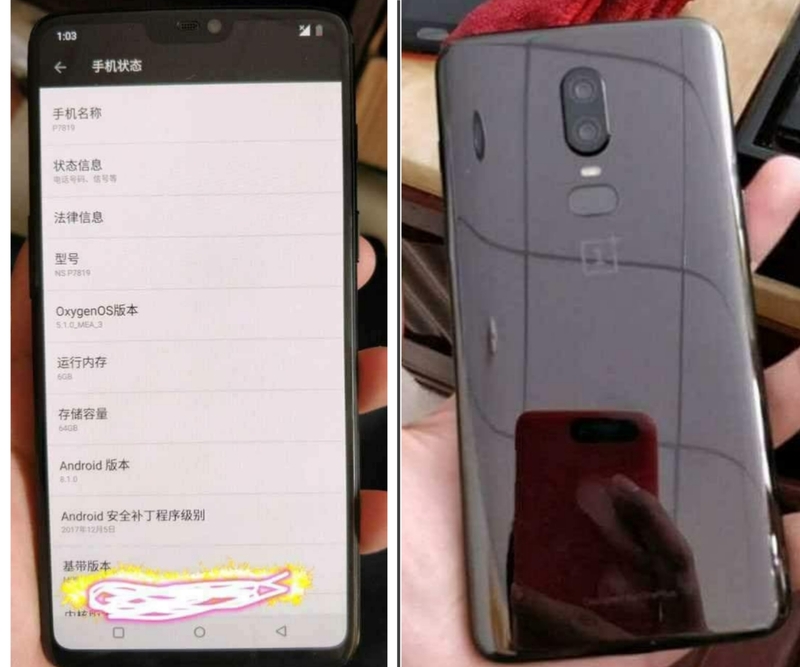 From both images above, we can clearly see that the new OnePlus 6 smart phone, might be coming with the now popular, but not globally accepted iPhone X inspired notch (yes, i used the word "might", because those are just leaked photos, they might decide to completely take away the notch from the final product, depending on the reactions they are getting from their fans). Can you as well spot the presence of rounded cornered screen on the device, if this is true, then this will be the first device to spot a rounded corner display on the OnePlus series. Then coming to the back, we have something that might make you think Samsung actually stole the Galaxy S9 designs from OnePlus. The back of the device is equipped with dual cameras, that are vertically placed at the center of the device, then a rectangular fingerprint reader, comes directly below them. For now, we don't have any ideas for how the cameras setup is going to be, or what the pixel count is going to look like, but all we know is that, the OnePlus 6 smartphone, will be launching with the new Qualcomm Snapdragon 845 processor, android 8.1 Oreo as well, 6GB(s) of RAM, and 64GB(s) of onboard storage, and finally the OnePlus custom ui, OxygenOS 5.1.0, and it will be launching in the the second quarter of 2018. So as usual, these are just mere rumors, and should be taken with a pinch of salt, and pepper. We'll keep updating this article for as long as we were able to get more hints concerning the OnePlus device. So make sure to subscribe to our daily newsletter to get notified of it. Meanwhile, tell us what y'all think about the upcoming OnePlus 6 smart phone. Are you in support of the notch display, or against it? As well tell us what features you wish to come along with the new OnePlus 6 smart phone. have a nice day..